Excited for your upcoming vacation? While you may have thought about when you’re going, what you’re doing and who you’re seeing, have you thought about your health? Traveling can take its toll on your body – especially those longer flights. Middle-aged and older adults need to be more careful, as they may be more at risk for some of these problems. But with a little proactive planning, you can avoid some of the most common flying-induced, vacation-ruining health troubles. What are some of the health problems flying passengers face? Immobility. Sitting in an airplane seat for prolonged periods of time can lead to muscle tension and spasms, body aches and decreased blood flow in your legs. Decreased blood flow in your legs can increase your risk for blood clots, which can become especially dangerous if they travel to the lungs. 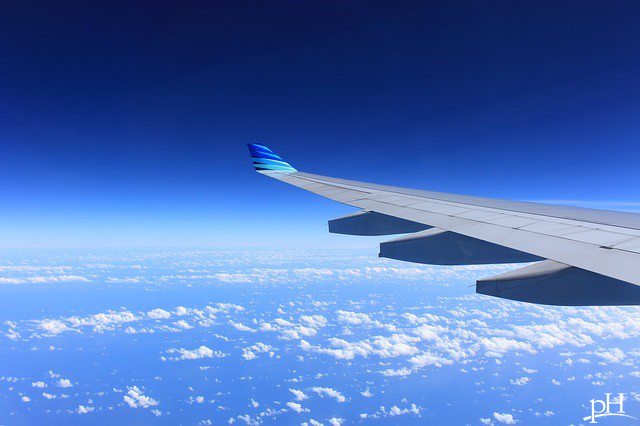 Air travel for over four hours increases clot risk threefold. Jet lag. A combination of sleep deficiency and sleep difficulty when adjusting to a different time zone can leave you feeling exhausted. It can decrease your energy levels, immune system and overall health. Respiratory infections and other infectious diseases. Although the majority of air travel infections tend to be minor, some may cause moderate to severe infections such pneumonia. Most respiratory infections are transmitted by hands, touching contaminated surfaces and direct exposure to coughs or sneezes. Less oxygen. Decreased cabin oxygen levels may exacerbate existing heart and lung conditions. Low humidity. Aircrafts usually have 10-20 percent humidity, which can cause excessive dryness in your airways, eyes and skin. Anxiety. 40 percent of travelers experience some degree of anxiety during takeoff and landing. Keep moving to prevent blood clots. Staying sedentary for hours on end can increase your risk for blood clots in your legs. The clot can travel to your lungs. Be proactive and stretch frequently and try to exercise your calves every hour. Flex and extend your ankles, and straighten out your legs when you can. Walk up the isle every two hours. Contracting and relaxing the muscles will help get your blood moving. 85 percent of cases of deep vein thrombosis (blood clots) were in non-isle seats in one study. Sitting by the isle may make it easier for you to move around more. Reduce jet lag. Try to arrive at your destination earlier in the day and then stay up till the end of the day. Exposure to bright day light will help to adjust your body’s clock to your destination’s time zone. You may want to try using a bright light therapy device like the Valkee to help your body adjust. Melatonin can also be helpful. Travel healthy. Avoid traveling when you are sick, and use increased caution with chronic heart and lung conditions. If you have an ear infection, ear pain and/or sinus pain, this may get worse with pressure changes inside the aircraft. Take precautions when necessary. Make sure you are aware of any warnings about SARS, tuberculosis, Ebola, influenza or new viral strains, as well as what the recommended precautions are. And remember to wash your hands when traveling, especially after touching bathroom surfaces and door handles. Respiratory face masks may be useful, especially during times when there is sneezing or coughing from nearby passengers. Stay hydrated. Make sure you drink 8 oz. of water at least every 2-3 hours. Get a checkup. If you have any health concerns or chronic conditions and are planning to travel, make sure to consult with a doctor. Be proactive!